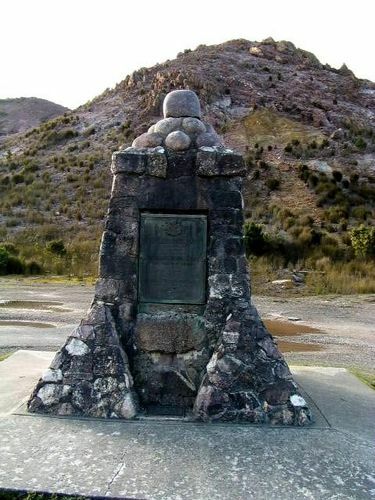 Monument commemorates the opening of the West Coast road between Hobart and Queenstown in 1932. The people of Queenstown, and of the West Coast generally intend to make tomorrow a red-letter day in their calendar. After many years of comparative isolation from the two chief centres of the state, a highway has been built connecting Hobart with Queenstown, and tomorrow the Lieutenant-Governor (Sir Herbert Nicholls) will perform the opening ceremony. This is to take place near the King River bridge, where the new road joins the one previously built from Queenstown. A feature of the ceremony tomorrow will be the unveiling of a memorial obelisk erected at the end of the new construction. This has attached to it a large copper plaque, about eight feet square, presented by the Mount Lyell Mining and Railway Company, and it will provide a striking permanent memorial of an event of rich historical interest.